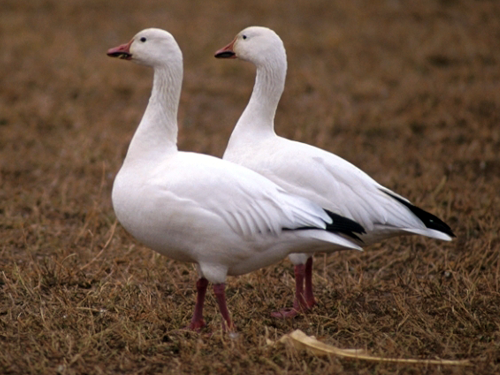 Light geese, being a very adaptable species, have expanded their breeding range inland, away from damaged coastal regions, and continue to increase their population size. Since 1999, spring snow goose hunting has evolved into a multi-million dollar industry that is expected to continue growing for years to come. As we enter the 15th year of hunting under the Conservation Order, Waterfowler.com encourages our readers to partake in this special hunting season and help expand our efforts to protect fragile, coastal habitat from ever expanding populations of light geese. With the duck season closed, hunters in Arkansas have switched gears, unpacked their legions of snow goose decoys and cranked up their e-callers. Hunter success is good to excellent at this time in the northeast portions of the state for mobile hunters that can get on the “X.” Light goose numbers are fair to good in Illinois and Missouri and huntable numbers are present from Peoria to St. Louis. Squaw Creek National Wildlife Refuge remains 95% frozen at this time and snow geese have yet to arrive on their return migration. At this time, migrating adult snow geese are stocking to the river systems where water is open. Snow cover in the Central and Mississippi Flyway increased significantly over the past week. While the accumulation was not enough to prevent a quick thaw if warmer conditions arrive, any barrier to migration is always welcomed by spring hunters.